IPS e.max® is an innovative, lithium disilicate glass material that enables the creation of strong, life-like, highly aesthetic, all-ceramic restorations. The material is highly translucent and very versatile, suitable for use in the creation of many different types of restorations such as crowns, veneers, inlays and onlays. 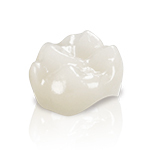 Our IPS e.max® crowns are milled using state-of-the-art CAD/CAM technology. For specific cases, we also resin print the material and then traditionally press it into a monolithic form. Because IPS e.max® is a monolithic restoration, there is no need for framework (limiting the need for preparation) and no risk of delaminating of porcelain. IPS e.max® would be Precision’s recommended choice of material for highly aesthetic single anterior crowns. Process CAD/CAM designed and manufactured.